Objective Digital recently teamed up with TNS and IAB Australia to study the Australian mobile advertising landscape. Our goal was to identify opportunities in the market, the readiness of the industry and the effectiveness of the platform in delivering advertising. Meanwhile, the Mobile Marketing Association (MMA) and IHS Global Insight conducted a similar study to understand the impact of mobile marketing on sales. Were there any correlations between the 2 studies? According to the US study, the mobile marketing spending will reach $20 billion by 2015. Every $1 spent on mobile marketing has been estimated to generate $20 in sales. Mobile advertising accounts for almost 50% of mobile marketing spending. Mobile web advertising has the biggest share. 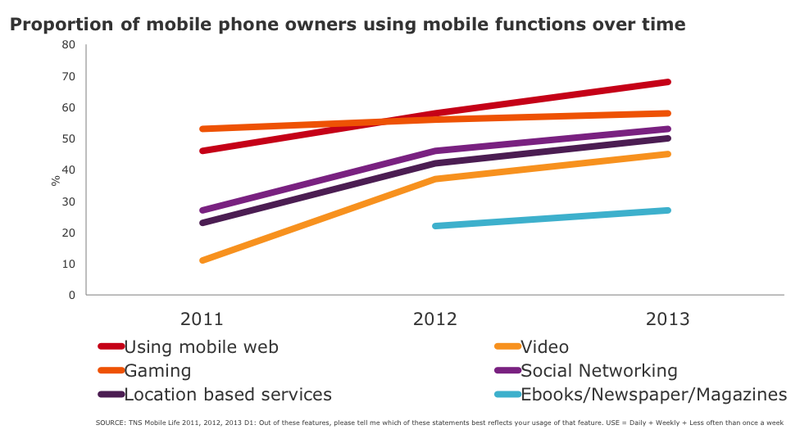 This correlates with the steady growth in mobile web usage in Australia in the past 2 years. Although mobile web is getting the biggest share of ad investments, MMA is predicting a 158% rise in investments on mobile app ads over the next 2 years to reach $3.26 billion in 2015. Mobile apps are platform dependant and cost more to build and maintain than mobile websites which work across platforms. However, more and more users are expecting the seamless experience and access to built-in phone features (such as camera, GPS etc.) which are more difficult to implement on a mobile website. TNS recognises this as a niche market as currently less than 1% of installed apps are branded. 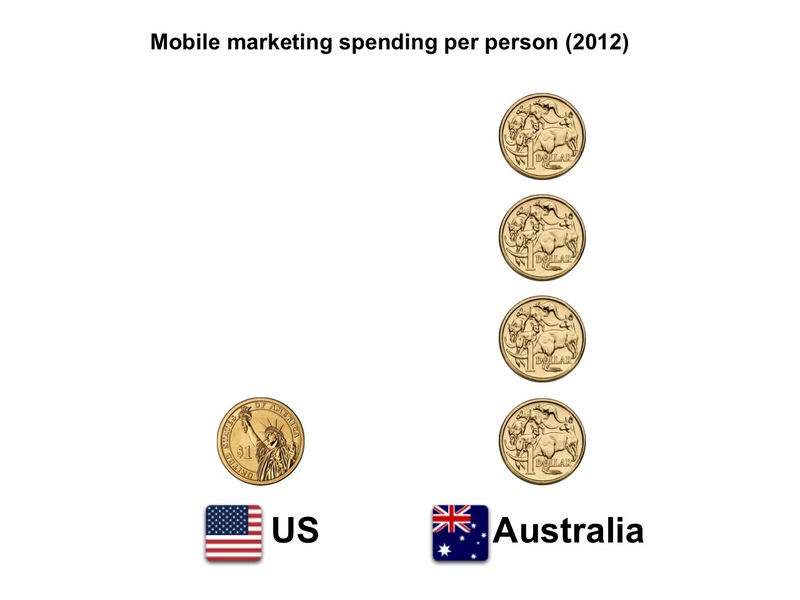 The Australian industry is spending more money per person than the US in mobile marketing. In 2012, the US spent $306 million compared to Australia’s $86 million. The TNS / IAB research shows that although the Australian industry is aware of the global trends around mobile growth. But despite the awareness and the increased spending, there is a lack of familiarity with the different types of mobile adverstising that are available (e.g. location-based services, mobile game ads, augmented reality, NFC. etc). This lack of familiarity is resulting is a lot of lost opportunities in mobile marketing. It’s all well and good spending money on mobile advertising, but do people look at the ads? Objective Digital used a mobile eye tracker to find out. We found that people were more receptive to an ad during passive consumption of content (e.g. news catch-up) than active consumption (e.g. looking for local weather). Ads on smartphones were looked at less frequently but people looked at those ads 17% longer than tablet ads. But the most critical component of ad effectiveness was consumer relevance. The ad needs to be relevant to what the user is doing or looking for. Despite the spike in mobile device usage, the majority of the mobile ad market is still untapped. You have the potential to have your company in your customer’s pocket at all times. If you haven’t thought about your mobile marketing strategy yet, you haven’t planned for the future. Drop us an email if you would like more information on this study or if you would like help making your mobile ads more effective through eye tracking. This entry was posted in Eye tracking, Eye Tracking in Sydney, Mobile eyetracking, Mobile marketing and tagged Mobile Eye Tracking Sydney by Nirish Shakya. Bookmark the permalink.